Fairweather Friday and us carbon-based lifeforms have no carbon-blitzing lift to hand. However, infused with the Wiggo spirit of Team GB, we saddle up, Trott off down Dobbs Lane and Hoy it over to Hall Road. Touch of the Pendletons along Purdis Road, up Woodhouse Lane and hey, let's catch up that fella on Bucklesham Road. Waddya know, it's our Defiants ping-pong colleague Steve. Kenny join us for lunch? Why, yes he can. 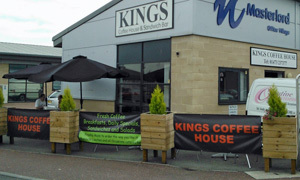 Past Sainsbury's and it's left hand out at the Burger King stroke B&Q roundabout where there's a big ol' banner pointing the way into Ransomes Europark, specifically to Kings Coffee House. Left again, up to the end and it's up here on the corner, thank goodness. Despite the name, I had visions of a temporary abode like Langers. Not so. Inside is neat and trim with smart wooden tables, a bit like Isaacs, with local papers and a few glossy mags too. Obviously popular with the takeaway crowd, there's a steady queue. Leaving aside the pre-prep-ed baps and boxed salads, we order from the list of specials and find a table (with parasol) outside. View is everything you'd expect in the middle of an industrial estate. But the food, brought out on a posh square white plate, defies expectations. A wrap with spicy chicken goujons, plus garnish, is mighty tasty, and served with a smile. Coffee that eventually follows is perfectly fine, too. So if you find yourself in the area, perhaps picking up a parcel or getting that car serviced, do pop along. If it was a car -- Oldsmobile Cutlass. If they were passing by -- Willem-Alexander.